Brian's been blogging about funny foreign stuff so here's my contribution! 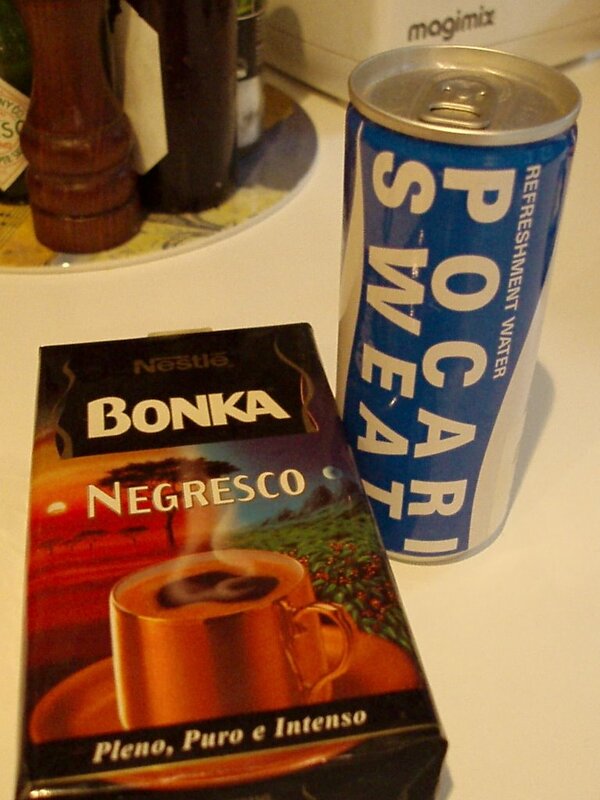 The coffee is from Spain and is just the thing for a post-prandial pick-me-up, while the can of "refreshing water' was purchased in Japan. My all-time fave was a bar of chocolate I bought in France called Crap! ah - le plaisir de crapsiller. I ate it and it was indeed a plaisir. I should have kept the wrapper. There also used to be some French Lemonade called Shittt but they've stopped making that now which is a pity. 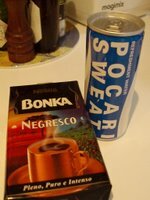 BONKA and SWEAT - yep, well, I guess they do kinda go together... But ending production of Shittt is not just "a pity" but also "shittty"! If you had a can of that and a CRAP! wrapper you'd have a very funny photo!